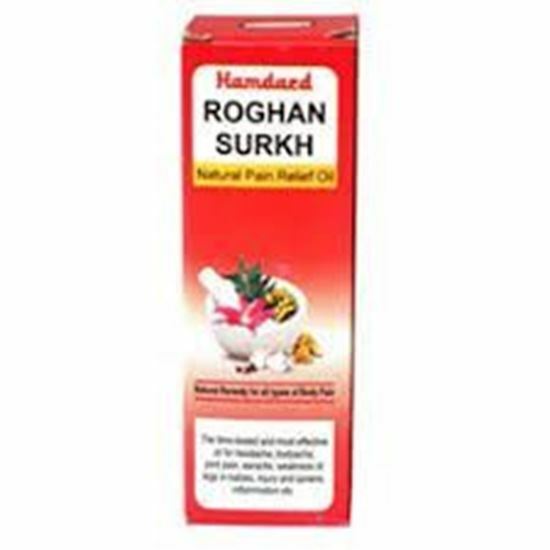 Roghan Surkh is a natural pain reliever. Roghan Surkh is used for headache, body ache, joint pains, earache, weakness in legs in babies, injury and sprains, swelling etc. For external use only. 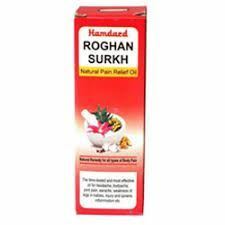 For headache: Rub a little Roghan Surkh on the forehead. For Body ache: Apply on the affected part. Bites of insects: Use at the place of bite. 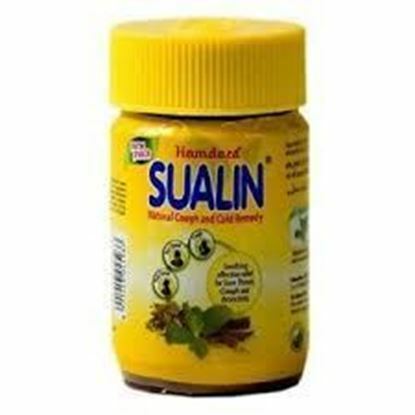 For joint pains: Apply on the affected joint. Cough, cold & influenza: Warm the oil slightly and massage on the chest and throat. Weakness of legs in babies: Massage daily on both the legs of the child. Earache: Warm the oil slightly and put 2-3 drops into the paining ear. Injury and sprains: Warm it slightly, apply and bandage on affected portion. Swelling: Warm the oil slightly, apply on the swelling, cover it with a warm betel leaf or "peepal" leaf and tie with a cotton bandage. Ushna: Used for stiffness and stress. Burada Sandal Surkh/ white sandal wood: Used as astringent and disinfectant. 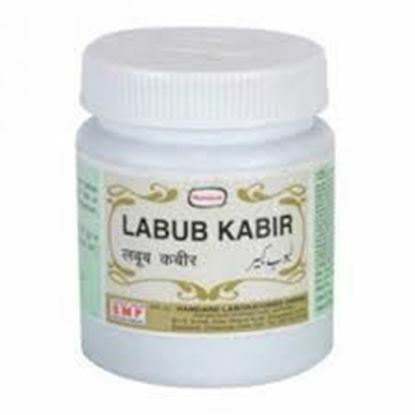 Habb-ul-Ghurab: Used for releiving pain. Darhald/root/berries: Used for joint pain, general weakness etc. 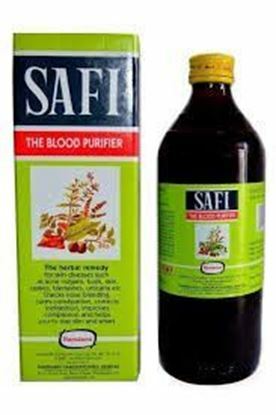 Kaifal/myrica nagi: Used in increased body temperature. Narkachoor/zedoary: Used for treating wounds, pain, swelling, skin problems. Haldi/turmeric: Used for arthritis and joint pain. Berg Aakh Taaza; Used in swelling. Lahsun/garlic: Used for blood circulation, bacterial and fungal infection. 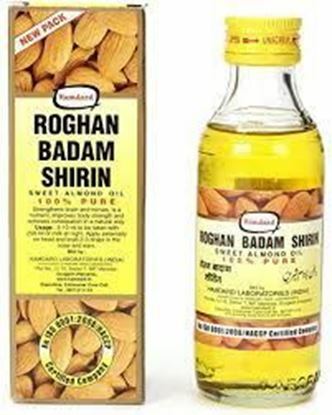 Surkh Roghani Rang: Used for colouring. As prescribed by the doctor. No side effects reported, but if you feel any problem consult with your doctor. Hamdard Labub Kabir has Khusyalus Salab, Narjeel Taza, Maghz Pista, Maghz Badam, Maghz Funduq, Maghz Akhrot, Maghz Chilghoza, Behman Surkh, Zanjabeel, Todri Zard, Khulanjan, Darchini, Burada Qaseeb Gao, Saad Kufi, Suranjan, Qaranfal, Chharila, Tukhm Shalgham, Warq Tila, Amber Ashhab, Ood Kham, Jauz Buwa, Tukhm Piyaz, Daronaj Aqrabi, Tukhm Turb, Zarambad, Shaqaqul Misri, Mastagi, Tukhm Halyun.